Valentine's Day isn't something that I bother much with myself even though I do have a very special person in my life. I show and tell my husband each and every day how much I love him and value him, and I certainly don't relish occasions that make people feel compelled to dash off to the store to purchase things that aren't really needed, such as overpriced roses and treats, or spend an excess of money at expensive and crowded restaurants. My husband is very fortunate to get special meals and treats on a regular basis as part of my food blogging project and just because I like to provide good nourishing meals. And he likes to treat me too, all year round. 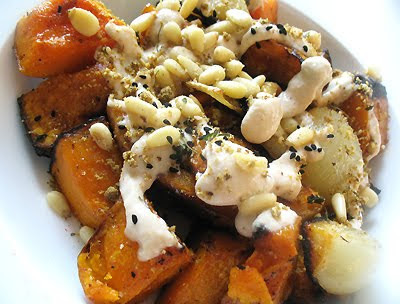 But Valentine's Day is an excuse for many people to prepare special foods for their sweethearts, and if you're looking for ideas you may want to try some of these vegetarian recipes that will certainly illustrate your passion for your honey. From breakfast to dinner right through to tempting treats and desserts, there's no shortage of opportunity to make this a special day for your most loved one. 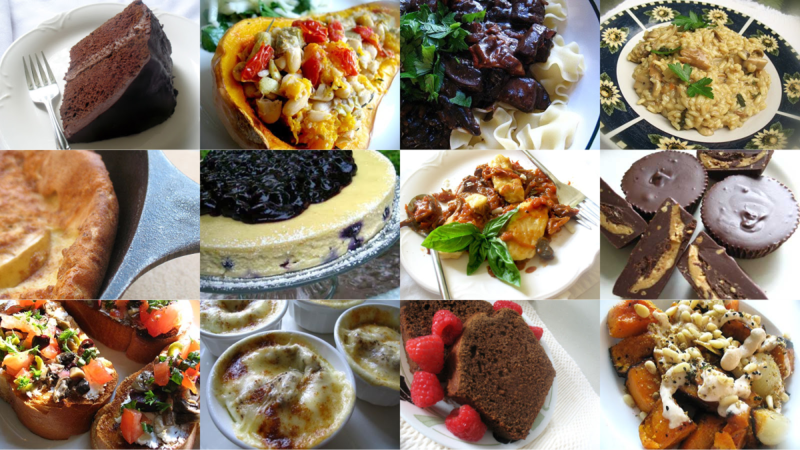 You will find many more ideas to celebrate any occasion by browsing through the recipes that I have shared with readers including some nourishing and delicious side-dishes to go along with your meals. Though this list of suggestions was written for those in mind who enjoy Valentine's Day, I was also considering creations for any special occasion or for no reason in particular except for wanting to have a lovely meal along with some delights to treat your loved ones. So let's start with some rather decadent sweets and desserts! 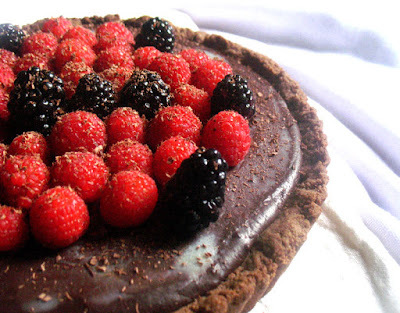 This Raspberry and Blackberry Dark Chocolate Truffle Tart with a Teff Crust is both beautiful and easy to make. Filled with luscious dark chocolate and a layer of berry spread, and topped with a scattering of tart fresh raspberries, this tart is a centerpiece that will enchant your sweetheart. 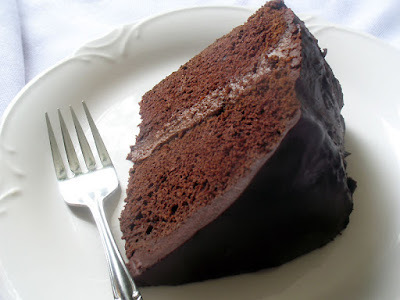 If there are two words that describe Valentine's Day desserts, they are "chocolate" and "cake". This Chocolate Cake with Chocolate Filling and Ganache is moist, rich and delicious and not-too-sweet eggless and dairy-free layered chocolate cake with chocolate filling and ganache — a treat for your sweetheart and you. 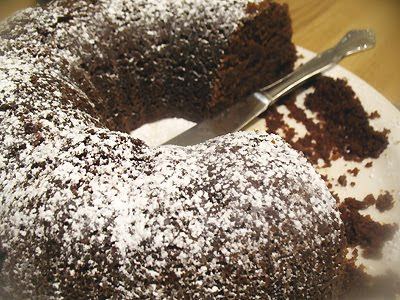 This Chocolate Chili Cake is just like what it sounds — chocolatey with a hint of heat from chili powder. Serve it with fresh raspberries for a plate that looks just like it belongs on the Valentine's Day table. Not chocolate this time, but this Greek Sesame Tahini Cake with Spelt and Mixed Dried Fruits will absolutely enchant your sweetheart. 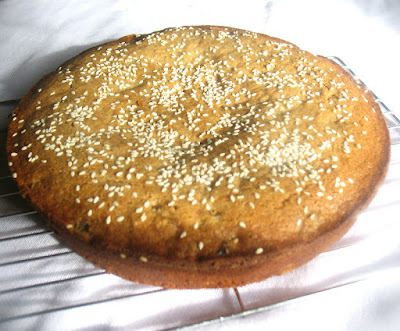 Moist with a myriad of flavors from dried fruits, vanilla, lemon juice, tahini and sesame seeds, this Greek-inspired vegan cake is easy to make and is a perfect dessert on a special day. 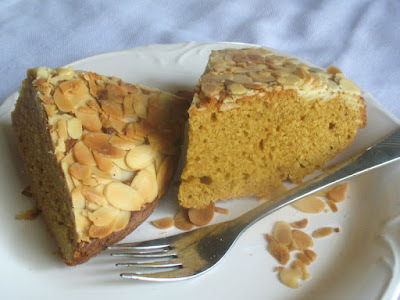 I've spoiled my own husband on more than one occasion with this Olive Oil Almond Cake — he and I love it every time. 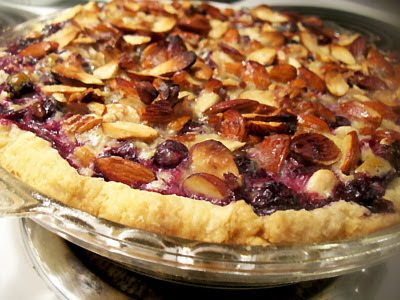 So simple but delicious and none-too-sweet, this is one for almond lovers. 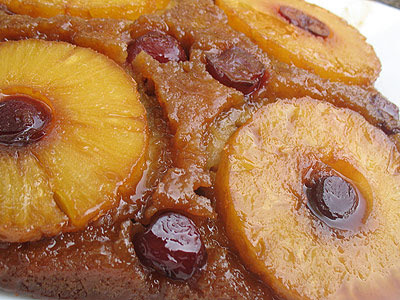 With fresh pineapple and cherries and a combination of spelt and quinoa flours, you could call this a "grown-up" version of the classic Pineapple Upside-Down Cake — making it entirely appropriate for grown-up occasions like your special day with your sweetheart. It''s just as good as you remember it. 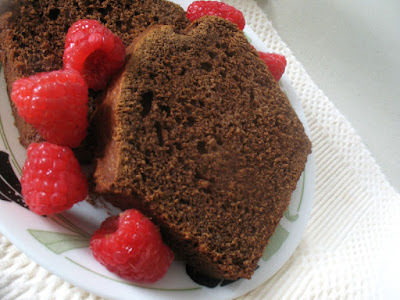 This is a all-time favorite, a rich, moist, flavorful and not-too-sweet Guinness Gingerbread Cake made with Guinness stout beer and fresh ginger. 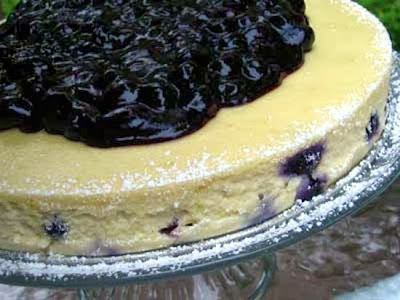 This Blueberry Ricotta Cheesecake is a winner and a very special way to say I love you. 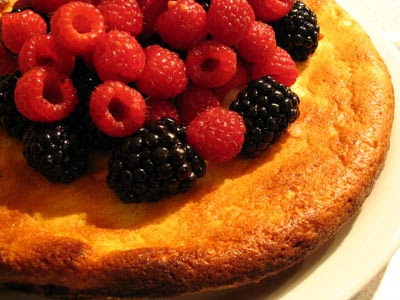 If your sweetie likes cheesecake, you must try this recipe. Speaking of cheesecake, it's always a favorite and so I offer up this Goat Cheese Cheesecake with Mixed Berries that will earn you lots of hugs. One of my favorites. And while we're speaking of goat cheese, pie may not be everyone's idea of a typical Valentine's Day dessert, but I've never met a man who won't eat pie any day of the year. So if it's a special occasion like Valentine's Day, treat him to this elegant Blueberry Goat Cheese Pie that's more than just a cut above the basic blueberry pie. 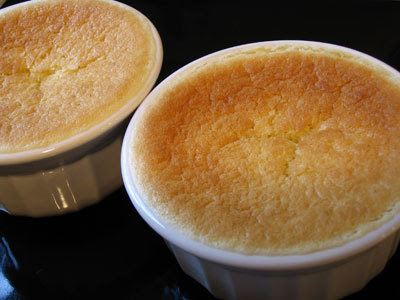 This Lemon Sponge Pudding for Two is so pretty to look at and so sure to please the palate of your honey. A perfect dessert for two. Romance = elegance. There is nothing more pleasing than a combination of chocolate and peanut butter. 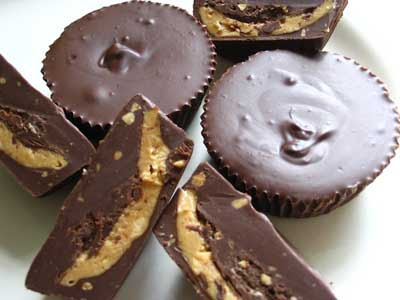 Your sweetheart will be craving these homemade Peanut Butter Cups for months after tasting them. 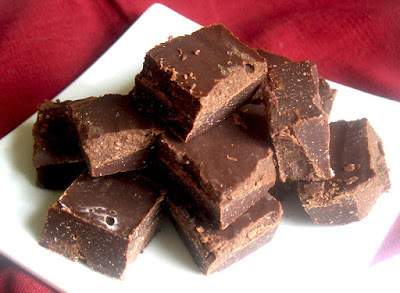 My husband calls a piece of this Tahini Freezer Fudge the "best piece of chocolate" he's ever had. So if you're like so many of us who think chocolate must be had at Valentine's Day, the love of your life will love you for this chocolate. 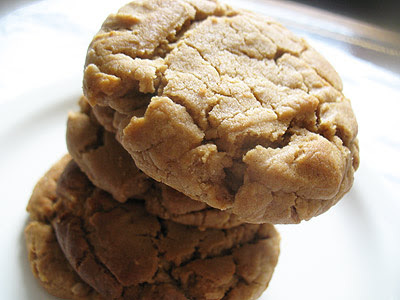 If you really want to spice things up, try these unique Cayenne Peanut Butter Cookies. I know my husband thought that these were some of the best cookies he has ever eaten. 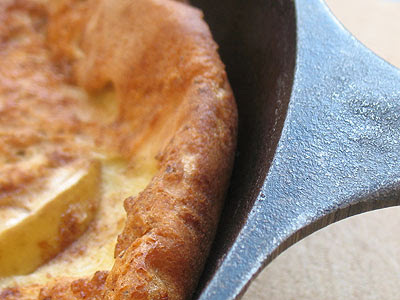 Almost like having dessert for breakfast, this Baked German Apple Pancake (known as Apfelpfannkuchen) is a soft, sweet baked soufflé-like baked apple pancake with the inviting homey aromas of brown sugar, cinnamon and nutmeg — in fact, it is just as wonderful for dessert as it is for breakfast. 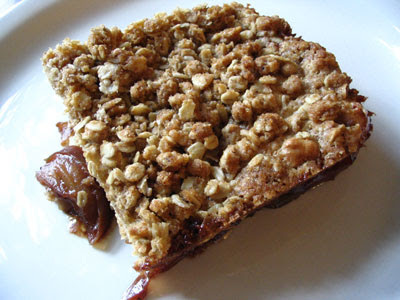 More apples in a rustic breakfast cake, this delicious Apple-Oatmeal Breakfast Streusel Cake has a sweet crunchy streusel topping, and the fragrance of ground cinnamon and apples will start your Valentine's Day with warm feelings. If you're planning for a Valentine's Day of delicious and decadent foods, then a great start would be these Apricot Rum Fritters. 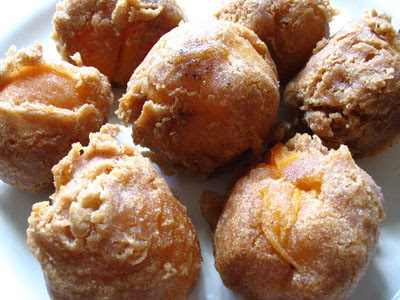 Just as good as they sound, rum-soaked apricots are rolled in a spiced batter and fried into warm, sweet and crispy fritters that are just extraordinary and will set the stage for wonderful flavor experiences throughout the day. 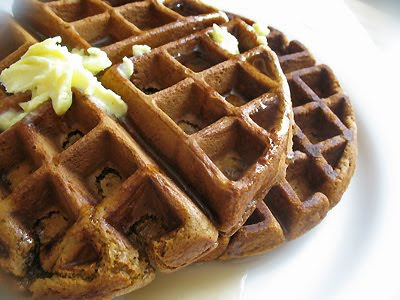 Light and chewy Pumpkin Gingerbread Waffles with a dark and rich molasses and gingerbread taste, these are a wonderful treat to share between the two of you on a special day, and the aroma is simply heavenly. One of the tastiest breakfasts I have ever enjoyed with my sweetheart, if you enjoy some spice in your life, be sure to consider trying Indian-Style Baked Eggs Florentine. A frittata makes for a filling and attractive breakfast on a day where you want to spend a little time spoiling your sweetheart. 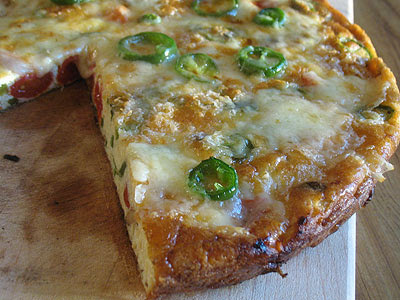 This Jalapeño Frittata is just the thing for couples who like a little heat in their breakfast, and it's lovely too. 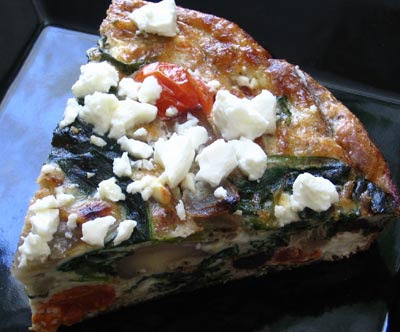 If you and your loved one enjoy eggs and cheese as much as I and mine do, then this Greek Feta and Olive Frittata will be sure to impress both of you. Feta and olives are a perfect couple too. 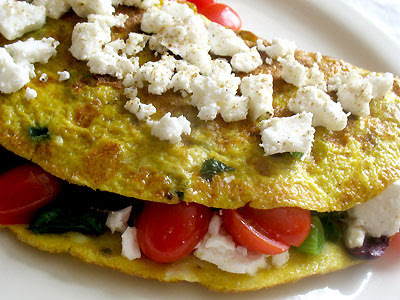 And if you want a lovely Greek egg dish to start your day but without taking as much time and trouble, this four-egg Greek Omelette with spinach, tomatoes, olives and Feta cheese is a simple, colorful and delicious breakfast for two. 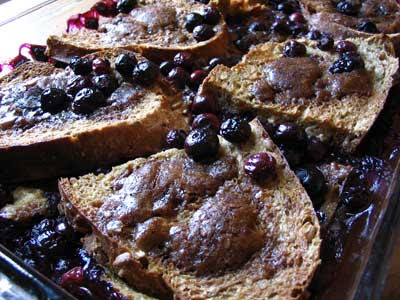 I can't think of a better way to start the day than with this Eye-Opening Blueberry French Toast. 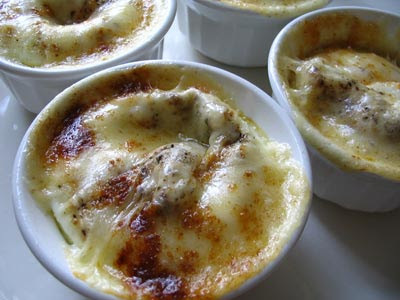 Warming and filling, it can be prepared the night before and popped into the oven in the morning. 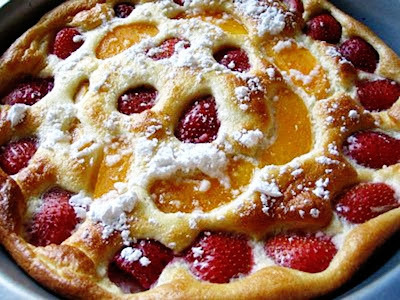 These Baked Strawberry Pancakes are especially easy to make and a real delight for a very special breakfast. 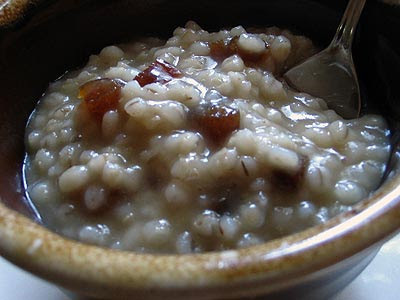 If you're planning to start your Valentine's Day with a leisurely breakfast cooked with love and care, this Turkish Barley and Apricot Porridge — or Anooshavoor — is a sweet, creamy and wonderfully fragrant barley and dried apricot porridge that is spiced with cardamom and cooked slowly in a risotto style. 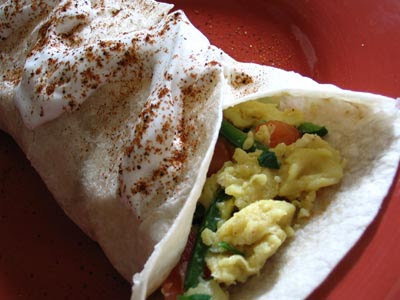 For an extra jolt in the morning, these Jalapeño Breakfast Burritos are a must. 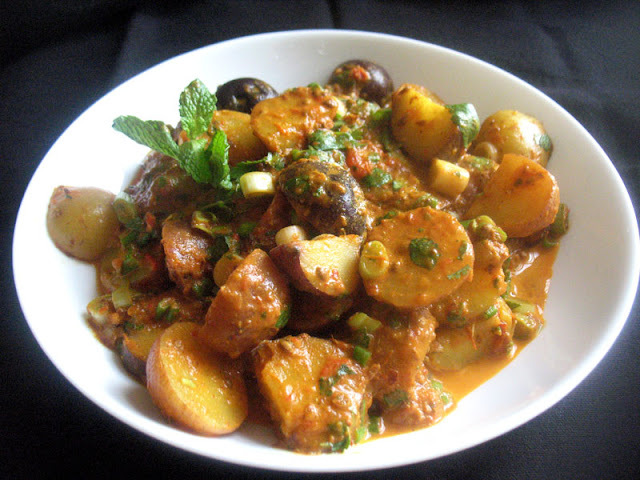 Healthy and filling and you just know that if your sweetheart likes some heat, he will be asking for more. Here is a good alternative for those who wish to enjoy a vegan breakfast with their mate. 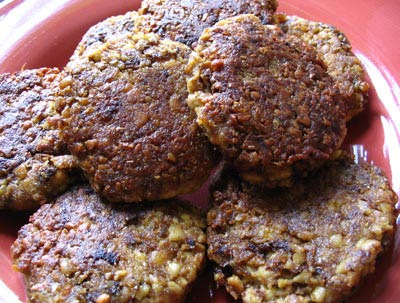 Give these Tempeh-Miso Breakfast Patties a try. 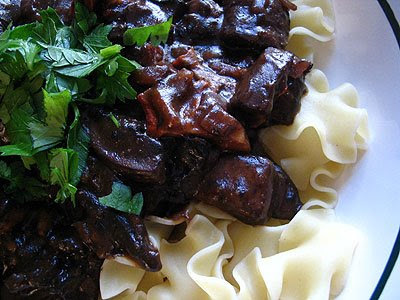 This Vegetarian Mushroom Bourguignon is ideal for serving to your sweetheart if he shares a passion for plump mushrooms simmered in a rich, thick and delicious red wine sauce. Everyone loves risottos, don't they? 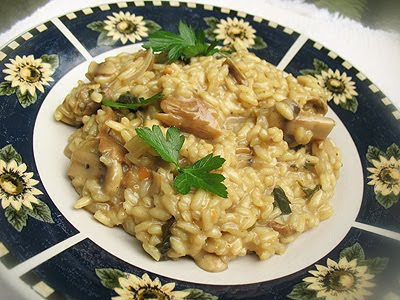 This Mushroom Risotto is a rich, earthy, creamy and perfect risotto to savor over dinner for two. Italian may or may not be the most romantic cuisine there is — I think it is — but it is always delicious and a delight to share with your loved one. 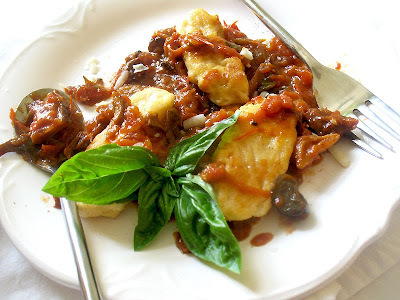 Ricotta Gnudi are tender, creamy ricotta cheese pasta dumplings that are served with a rich, vibrant and zesty homemade tomato sauce. Among so many Italian classics, lasagna has always been a special favorite. 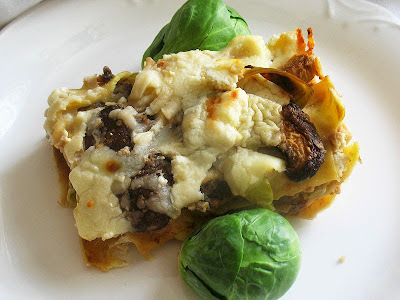 Rich and delicious, this Brussels Sprouts Lasagna is filled with mushrooms, cheese and sliced balsamic brussel sprouts for an elegant and unique Valentine's Day dinner. 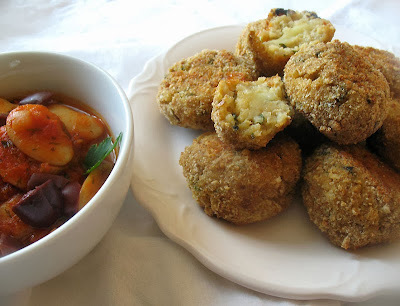 Something I always order when having a romantic dinner at an Italian restaurant are arancini — I just adore those little balls of mushroom risotto and cheese fried up into extraordinary savory bites. If you're spending Valentine's Day at home, you can so easily recreate this rich and delicious experience with your sweetheart by making your own Baked Mushroom Arancini — just as delicious, creamy and cheesy. In my house, a homemade bruschetta is so beautiful to look at and so delicious to eat that it can't help but be something to share with your most loved one. 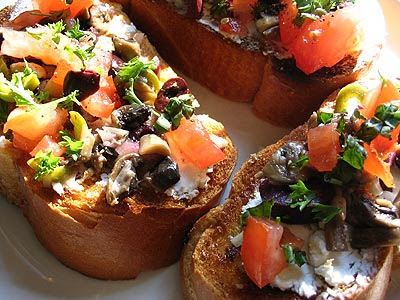 This Olive and Goat Cheese Bruschetta features toasted Italian garlic bread smothered with a colorful and delicious array of mushrooms, olives, tomatoes, soft goat cheese and fresh herbs. 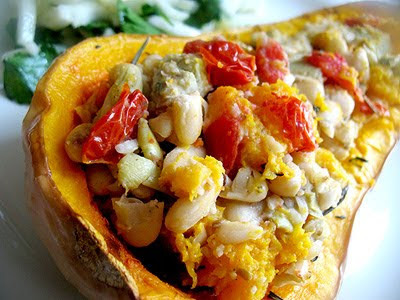 Roasted Butternut Squash and Herbed Cannellini and Artichokes with Fennel and Parsley Salad is a perfect dinner for two — tender roasted golden orange butternut squash mixed with a baked casserole of creamy cannellini beans, delicate artichokes, sweet cherry tomatoes and fresh herbs, and served with a fresh crunchy and slightly tart fennel and parsley salad. 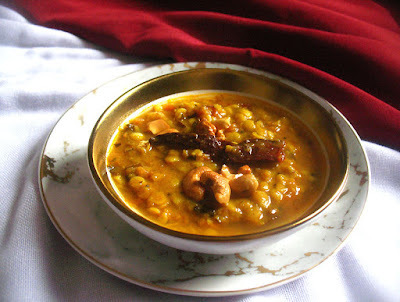 For a spicy and delicious romantic dinner, this Gujarati Dal is a tantalizing way to share your love. 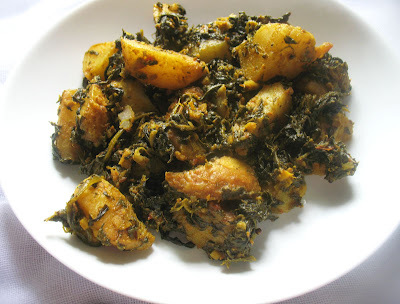 This Spinach and Potato Curry (or Saag Aloo) is technically a side dish, but it is my most popular recipe and is so delicious that it will instantly make you popular with your own sweetheart. Soooooooooo manyyyy ideassss, wowwiee ... but now so difficult to choose!!! Any of these ideas would be reason enough to celebrate Lisa. they all look so good, not sure which one to make! Awww. Thanks for your kind comment Niki - you are sweet! 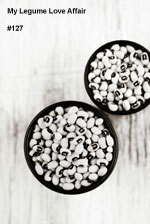 And thanks also for recognizing how much time and energy goes into my recipes and blog. I love the choices you picked and I would be happy to make any one of them.